Carbohydrate needs to be broken down by the liver to provide energy to the body. Compounds present in the guava leaves prevent conversion of complex starch to simple sugars in turn promoting weight loss. In a study done at Yakult Central Institute in Japan, it was found that guava leaf could effectively lower blood sugar levels in diabetics by reducing the alpha- glucosidase enzyme activity. Furthermore, it prevents the absorption of sucrose and maltose by the body, thereby lowering blood glucose levels. Drinking guava leaf tea for just 12 weeks reduces the blood glucose levels without increasing insulin production. According to a study done in the past, drinking guava leaf tea for 3 months was found to reduce LDL cholesterol and triglycerides without any adverse effects on the HDL levels. Moreover, guava leaf extract also acts a great liver tonic. Guava leaf improves digestion by stimulating production of digestive enzymes. The antibacterial agents found in the leaf kill the bacteria in the gut and stop the propagation of toxic enzymes by the bacteria. Guava leaves are particularly beneficial in case of dysentery, food poisoning, vomiting, and nausea. To alleviate stomach ache, boil 8 to 10 guava leaves in 1.5 liter of water and drink thrice a day. Fresh guava leaves have anti-inflammatory properties and can effectively relieve toot aches, mouth sores and gum diseases. They can also relieve sore throat when used for gargling. Guava leaves can be used to make natural tooth paste for brushing teeth and gums. Guava leaves can effectively treat bronchitis by opening up the lungs, loosening mucus and soothing cough. The compounds found in guava leaves prevent the release of histamine thus preventing allergies. 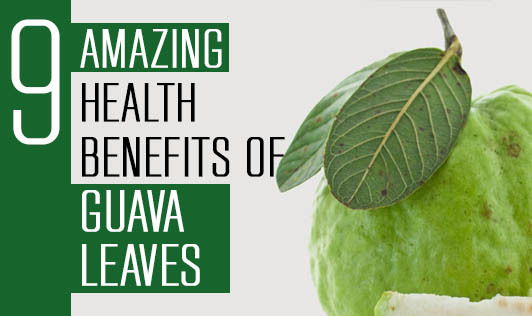 Guava leaves have immense healing properties and can effectively treat wounds and cuts. The antibacterial agents found in the leaf prevent infection and inflammation and hasten the healing process.